Jane started volunteering at Lovelane in 2008 and became one of our instructors in 2010. She graduated from Smith College with a BA in English and Art History. After college, she went straight into the publishing business, eventually becoming a Vice President at Houghton Mifflin. Jane left the publishing world after twenty-five years, looking for something new. Her love of children and riding experience made everything click during her weekly volunteering hours at Lovelane. 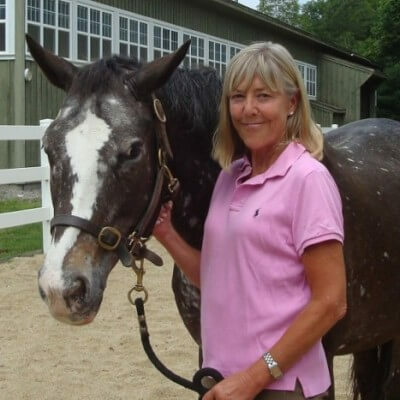 She set a goal to become a therapeutic riding instructor, and is now a licensed Massachusetts and PATH International instructor. Lovelane’s work is important to Jane because she can see clear and measurable progress in the students she truly cares about. More than anything, she is passionate about seeing the joy that accomplishments bring to her students.